As a retail manager, Thanksgiving marks the beginning of the busiest time of year for me. I rarely spend holidays with my family, but I did get to have a quick visit at home last week where we had a faux thanksgiving. My mom and I did some holiday shopping and then spent a few hours in the kitchen making a few favorite recipes and experimenting on an amazing pasture raised organic chicken from TrueCost Farm. We ended up with delicious new dish and a few tweaks for the next time. Preheat oven to 375 degrees. Zest lemon, mince 4 cloves of garlic and chop thyme. 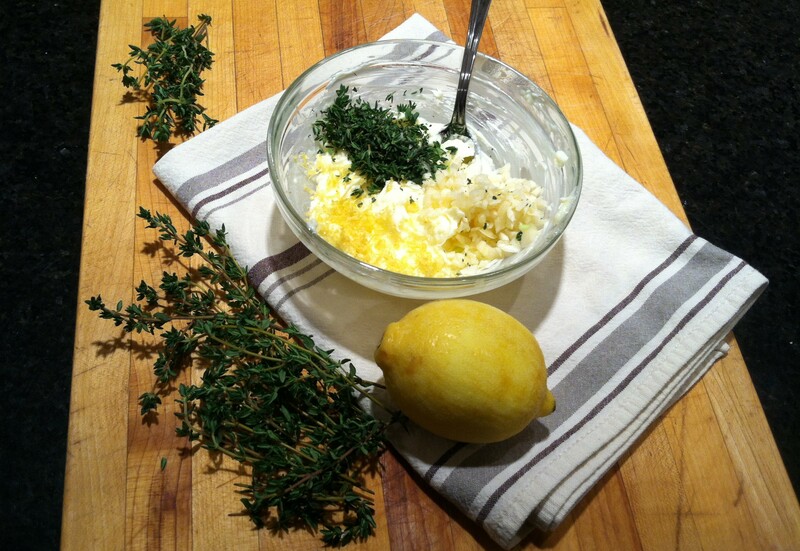 Combine lemon, garlic and thyme with room temperature butter. Carefully separate skin from chicken with your index finger spread the butter mixture under the skin all over the bird. Quarter the lemon and place inside the bird with a few sprigs of the thyme. 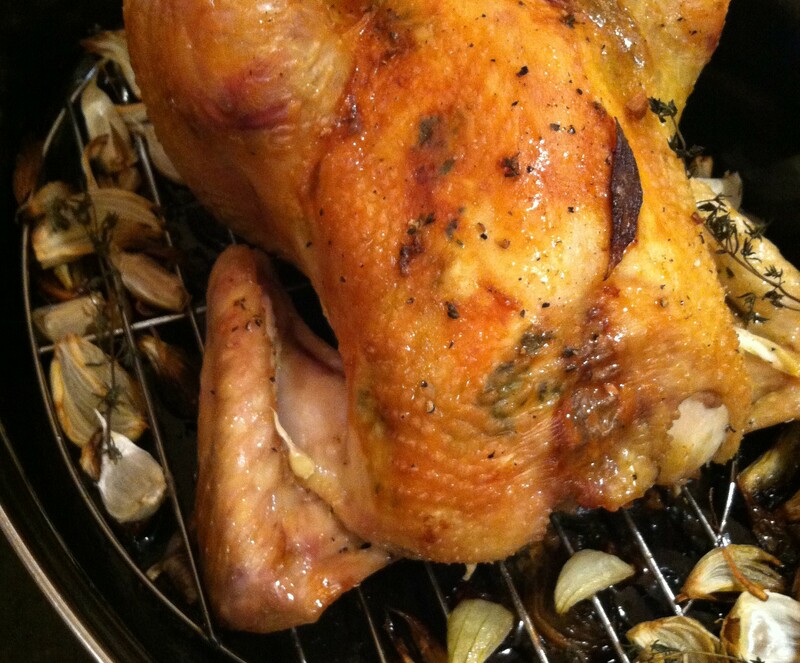 Place bird in a roasting pan with a rack. Roughly slice the onion and place around the bird in the pan. 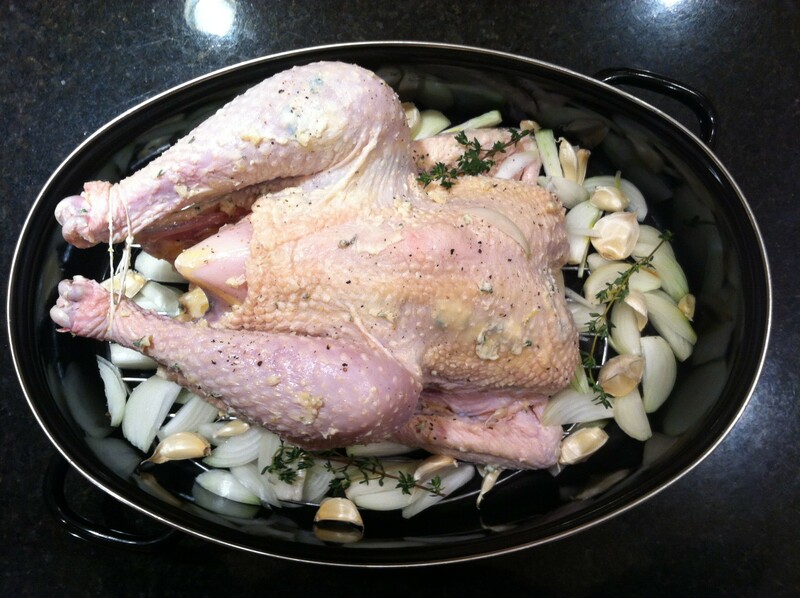 Place the unpeeled garlic around the bird with the onion. Add about 1/2 cup chicken broth to the pan (this prevents the onion and garlic from burning, which we found out the hard way). Cook in the oven for about 1 and 1/2 hours until an inserted meat thermometer reads at least 165 degrees. Remove from oven let rest for 5-10 minutes. Place the chicken on a cutting board and remove the rack from the pan. Place the pan on the stove over low heat. Add 1/4-1/2 cup dry white wine to the pan. Using your fingers remove the roasted garlic from the peel. Cook for 5-10 minutes until sauce has thickened. Serve sauce over carved chicken! Add about 1/2 cup chicken broth to the pan (this prevents the onion and garlic from burning). Remove from oven let rest for 5-10 minutes. Place the chicken on a cutting board and remove the rack from the pan. Place the pan on the stove over low heat. Add 1/4-1/2 cup dry white wine to the pan. Using your fingers remove the roasted garlic from the peel. 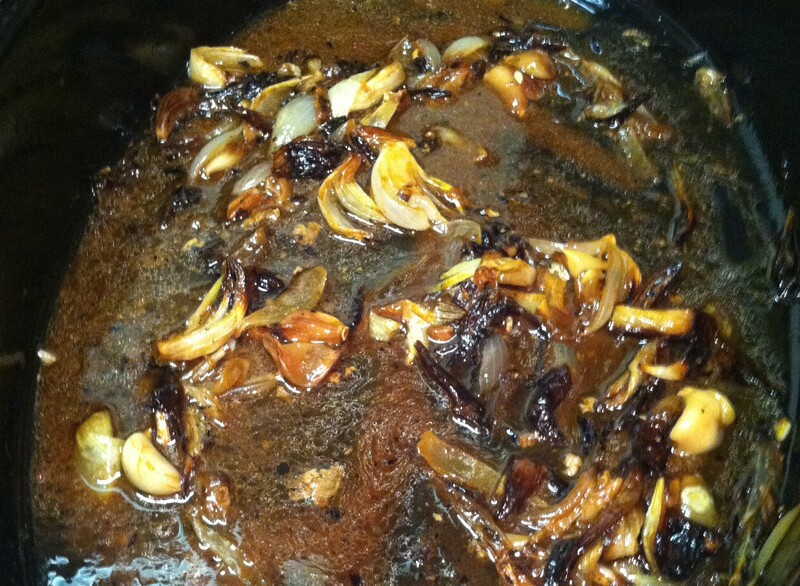 Cook for 5-10 minutes until sauce has thickened. Serve sauce over carved chicken!